Increase the productivity of your skid-steer loader with a trencher attachment from Manitou. Our trenchers have a double-flighted spoil auger, and excellent wear resistance on the drive sprocket ensures longer life. Various chain types, along with a number of chain styles and widths, are available to suit the soil type and project size. Manitou trenches, which feature manual or hydraulic side-shift to get up close to buildings, operate with hydraulic flows between 38 - 76 lpm. 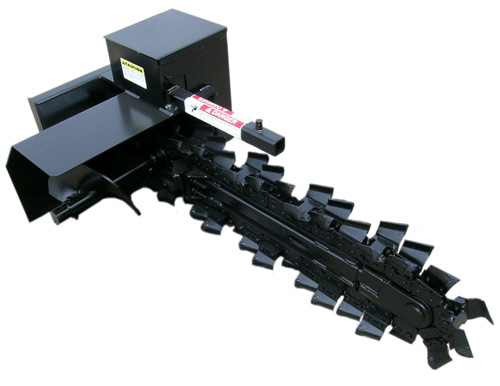 Trenchers are available in 609 – 1 219 mm digging depths and 152 - 305 mm trench widths and come complete with trench cleaner arm, hoses and flat face couplers.